South Park and Georgetown. Most affected by the contamination are Seattle’s most marginalized and impoverished communities – low-income, homeless residents, immigrants and tribal fishing families. In addition to residents, three Tribes use the river for fishing and/or cultural ceremonies, and low-income, immigrant and homeless families from throughout King County harvest seafood from the river for subsistence, and to maintain cultural and community traditions. Over 20 native languages are spoken throughout the valley. Further, due to industrial development, public access to the river is highly restricted. For all these reasons, attaining environmental justice is one of the driving forces shaping the community’s river cleanup and advocacy efforts. In 2013 and after 12 years in the making, EPA released its Proposed Cleanup Plan for the Superfund site, starting the clock on a 105-day public review and comment period. This highly technical document recommended a mix of technologies for addressing the river’s toxic sediments and meeting the four objectives of the cleanup, which include protecting the health of people who consume seafood. Recognizing the need for an informed, educated and organized community to advocate for the most comprehensive river cleanup possible, DRCC/TAG staff set off to design and implement a community engagement plan to give the many diverse communities impacted by the contamination a voice in the cleanup plans. This effort was supported in part by a $59,000 River Network Urban Waters Capacity-Building grant funded by EPA that DRCC/TAG received between 2011 and 2013. Additional funding to support community participation in the cleanup was provided by the EPA Technical Assistance Grant (TAG) Program. A River for All, a recently-released public awareness campaign, is led by community leaders and local personalities demanding a comprehensive, health-protective Duwamish River cleanup. Five-time Grammy-winning hip hop artist, Macklemore, is the campaign’s public face. 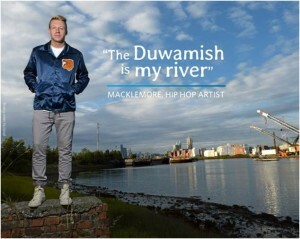 Hip-hop artist, Macklemore, heads the “A River for All” awareness campaign. Photo: Jason Koenig. Information presented at events was shared in 7 languages, 5 more than had been the practice before DRCC/TAG’s involvement. In addition, written materials were developed and distributed in three languages. The A River for All campaign spurred action from more than 43,000 people from across all 50 states in the nation, demanding a comprehensive cleanup of the Duwamish River. DRCC/TAG was founded in 2001 by ten community, environmental, tribal and small business organizations to serve as EPA’s Community Advisory Group (CAG) for the Lower Duwamish Waterway Superfund Site and as the Technical Advisory Group (TAG) to the affected communities. DRCC/TAG’s mission is to secure a Superfund site cleanup plan that is accepted by and benefits the affected community and protects fish, wildlife, and human health. Visit www.duwamishcleanup.org to learn more about current outreach and advocacy efforts on behalf of a comprehensive, health-protective Duwamish River cleanup. The Urban Waters Learning Network is coordinated by Groundwork USA and River Network with US EPA support. Go to www.UrbanWatersLearningNetwork.org for more information.